Research , questionnaire,typing and editing done by Major A.H AMIN (Retired),Tank Corps then Assistant Editor Defence Journal , Karachi, April 2001. Please tell us something about your early life before you joined the Army? I was born in Peshawar in 1928. Our ancestors originated from Kandahar and had settled in the Peshawar Valley, particularly at Pirpai (my ancestral village) near Nowshera. There is a Babar Settlement at Zhob and there are small communities of Babar, at Quetta, Multan and D I Khan (Chaudwan). 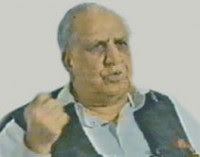 Nawabzada Nasrullah Khan also hails from the same tribe (Muzaffargarh). In the First World War 78 people went to the war as Indian Army men and four laid down their life. Pirpai is one of the very few villages which has an official plaque commemorating its First World War contribution. My father was basically a Recruiting Officer of the Indian Army but had been attached for sometime to the 6 Rajputana Rifles. After initial study of two years at a Private Public School (Miss Birch), I joined the Presentation Convent School Peshawar from 1935 to 1939. From 1939 to 1941 I attended the Burn Hall School then located at Baramula and Srinagar. (Please note that they shifted from Baramula to Abbottabad in 1947 since they did not desire to continue in India). From 1941 to 1946 I studied at the Prince of Wales’ Royal Indian Military College Dehra Dun from where I did my Senior Cambridge and also received one year’s pure Military Training. It was here in Dehra Dun that I was lucky to be the student of the well-known Mr Catchpole. Catchpole was a man of great devotion, conviction and dedication. He played a very formative role in our education at Dehra Dun. After Senior Cambridge from the Rimc Dehra Dun I appeared before the Services Selection Board at Meerut and was selected for the Indian Army in November 1947. We were airlifted to Lahore along with Muslim GCs (Gentleman Cadets) from the Ima as the First PMA and were privileged to be received by Mr Liaquat Ali Khan. I joined the PMA in January 1948. 2. Please describe your parents and their influence on your perception/personality? My father and grandfather were the two most honest and upright people that I saw in life. I was greatly inspired by both of these individuals and inherited their basic traits. In character building the role of mother was more significant. 3. Please tell us about any incident in your early years that left a lasting impression on your personality ? Two events left a particularly strong impression. One was the abject poverty and submissiveness of the Kashmiri Muslims, particularly the males owing to severe oppression by the Dogra rulers. However, the females were fairly aggressive in protecting their rights. The second significant incident was while proceeding to Meerut I saw a Muslim refugee train which had been attacked near Jagadhri in 1947. All my life thence I have not been able to reconcile with the feigned Indian democracy and been involved in four wars against India, viz; 1948 (Kashmir); 1965 Rann of Kutch, 1965 (Indo-Pak War), 1971 (Indo-Pak War). In three of these I found myself in Kashmir! 4. How was your student life? It was memorable. The missionaries at the convent in Peshawar and at Burn Hall Baramula/Srinagar were a dedicated lot. Education in those days was a very healthy combination of intellectual and physical activity. I got an early exposure to military training at RIMC where one year was completely dedicated to military training. 5. Any teacher who played a decisive role in formation of your perceptions/convictions ? There were many teachers who I can mention. There was Father Shanks, Father Moran, Father Louis a Dutchman who later died at Malakwal, Father Mallet, at Burns Hall and Mr Catchpole and Mr E I Connolly, a Battle of Britain fighter pilot, who had already received a DSO and DFC (Bar) at the RIMC. 6. How was life in PMA once you joined PMA ? PMA (Pakistan Military Academy) was again a most formative experience. The Commandant Brigadier Ingall was a towering personality. The platoon commanders were a fine lot. Initially there were some shortages and deficiencies of training equipment, particularly on the educational side. The emphasis, in view of experience of the recently concluded World War II, particularly Burma were on the military training. Kakul in any case had earlier been one of the choices for the Indian Military Academy, it had sufficient number of accommodation and training area as the Asc School was located there. Our platoon commanders/instructors were Major S.A Bilgrami (later Major General) Captain (later Maj Gen) Rao Farman Ali, Majeed Malik (later Lieut Gen), S.G Mendi (later Colonel) , Tikka Khan (later COAS). The silver was brought from various Brigade messes of frontier brigades (Wana and Razmak) which had earlier been deployed in the Tribal Areas and were withdrawn as part of Operation Curzon. The library was well stocked since all the books of Wana and Razmak libraries and DAV College Rawalpindi were shifted to the Pma library. I would like to add that during my stay in PMA I volunteered for service in Kashmir and took part in the 1947–48 Kashmir War as commander of a Tribal Lashkar in Jul/Aug 1948 in the Poonch Sector. 7. Which Arm was your first choice ? Almost my entire family had served in both horse and armoured. Cavalry, I did not want to be labelled as one who made use of his family connections. I had no relative in artillery and thus decided to join artillery so that I could sail on my own steam. My relatives were planning to get me commissioned to 6 Lancers and had even had my Armoured Corps service dress stitched! 8. How was life in the Army when you were commissioned, what was the world view of the young officer in Pakistan of the early 1950s? It was a Spartan life. It was an infant Army, deficient in equipment but with highly motivated people. Discussion on ladies and politics was banned. The performance in Kashmir (47-48) and response to the 1951 threat from India are truly indicative of the spirit. The people, too, were highly motivated as can be seen from the march of the Majhas and Gamas of Lahore towards the Indian border. The same spirit persisted upto the ’65 War. 9. What was your impression about Maj Gen Akbar Khan of the 1947-48 War and ’Pindi conspiracy fame ? I saw him as a guest speaker during my cadetship in Pma. He was a very impressive speaker and left a deep impression on all the cadets. He was the only guest speaker who outshone Brigadier Ingall, our Commandant who, otherwise, was an awesome personality and a great orator. 10. How did the young officer view the 1950 ’Pindi Conspiracy Case ? The conspiracy came as a surprise but all of us understood that it was a natural reaction against the abrupt ceasefire in the Kashmir War. 11. Please tell us something about your service profile from date of commission till 1965 ? I was commissioned in 4 Field Regiment Artillery in 1950. However, in those days all officers were initially sent to the basic courses. Therefore, I joined my unit after one year of basic courses at Infantry School Quetta and at Artillery School, Nowshera. Major Elmsley, a Britisher was particularly impressive as a gunner officer and a thorough professional. Also, there was Major Faizullah Khattak. He not only rated me as “Above Average” but also endorsed an excellent write up. It is to the credit of these senior officers that they acted with great integrity. progressively, This trait began to fade. As a select officer I was posted to the Artillery Centre – one of the places where select officers were posted, the other being the Mountain Regiment. This happened in February 1952. In September 1952 I volunteered for the Aviation and joined the 1 Air OP Flight at Chaklala, being part of Paf. In those days flying was a tough affair and we had those ancient God forsaken Austers! In September 1954 I was awarded my flying wings. In 1955 I was posted to 1 Mountain Regiment where I served as a Battery Captain till 1956. I was promoted Major in 1956. In the same year I was selected for a Gunnery and Survey course at Fort Sill Usa. It was there that I saw the old Austers in a military museum! In 1957 I returned from Fort Sill to command a Locating Battery in Sialkot in 1958, I was posted back to Aviation. In 1960 I attended the Staff College Quetta after which I was posted as Gso-2 (Operations) 7 Division Peshawar. Here I was lucky to serve with two extremely capable officers (Late) Lt Gen Attiq Ur Rahman and (Late) Lt Gen Altaf Qadir. I would say that Atiq was extremely sharp while Altaf Qadir’s most outstanding quality was extreme meticulousness. I must add that it was Altaf Qadir who was the architect of the brilliant plan to launch the 1st Armoured Division, along with 7 Division from Khem Karan. However, responding to situations rather than keeping to the original war plans, 7 Division less a brigade was moved to Chamb and 25 Brigade to Mirpur. The operation was then taken up by 1 Armoured Division and 11 Division. Another brilliant officer from whom I learnt professionally was Lt Col (later Brigadier) Haq Nawaz of the Baluch Regiment. In fact, my later success in career was due to this officer. While still with 7 Division, I was selected to attend a helicopter course in the US in 1963. A few months after return, I reverted to Army Aviation to raise the first helicopter squadron and was commanding 3 Army Aviation Squadron when the 1965 war started. I had earlier in the year 1965 participated in the Rann of Kutch operations. It was unfortunate for us that since Altaf Qadir was not in the good books of Ayub, he was packed off to Cento Turkey from where he voluntarily came back at his own expense once the 1965 war started but was sent back. While still with 7 Division, I was selected to attend a Helicopter Conversion Course in 1963 from the 7 Division after which I went back to the Army Aviation and was Officer Commanding in an Aviation Squadron once the 1965 War started. 12. How in your view was the 1st Armoured Division attack plan brilliant ? The plan was brilliant in conception. The fault lay in its faulty execution. If properly executed it would have totally thrown the Indians off balance at the strategic level. It was unfortunate that Altaf Qadir, who conceived the plan was sidelined and sent abroad. Altaf Qadir had visualised that the plan would be executed by the 1st Armoured Division along with the 7 Infantry Division with a Corps Headquarters in overall command. This did not happen in reality. Ayub and Musa were militarily naive. They agreed to Finance Minister Shoaib’s proposal not to raise an additional infantry division and an additional Corps Headquarters. Then Altaf Qadir had visualised that the infantry division would establish a bridgehead that would extend till line Harike Patti. But in reality the Armoured Division was launched prematurely thanks to Colonel (later Major General) Ghulam Umar. Also there was no co-ordination as Major Generals Nasir and Hamid were not even on speaking terms. 13. What made you join the Aviation Corps? I was interested in flying. The Aviation in any case offered great prospects for exercise of initiative for a young officer. I had desired to join the Air Force, but my principal, an Englishman had refused permission because of my aggressive nature at sport. 14. Any memorable incident in your flying career? The flying experience in 1965 war where I saw a lot and particularly the capture of an Indian infantry company in Chamb. 15. It has been said that there were lot of inter-arm rivalries In the Pakistan Army. How was Artillery your parent Arm viewed by the infantry and armour officers ? I feel that the fighting arm officers generally did not understand the importance of artillery. They were more interested in singlehandedly winning glory and battle honours and would not involve in fire planning. Considering it too technical I would say it was more a lack of understanding of the immense importance of inter arm cooperation. Particularly notorious in this regard was the 1 Corps in 1971 war. Despite the fact that the three battle winning factors in 1965 war were considered to be Allah, Air and Artillery! The 1 Corps Commander had no understanding of the importance of artillery. The most glaring example of this was the Battle of Barapind that could have been easily won, heavy artillery which was readily available in great bulk had been utilised at all. It has been the tragedy of the Pakistan Army that it has been foisted with infantry officers at the higher levels of command. 16. How was the 1958 martial law viewed by the young officers? Very few officers were involved in martial law duties. In retrospect I would say that it was the most unfortunate event in Pakistan’s history. Corruption was institutionalised from 1958. Initially senior officers started from buying dinner sets and proceeded in allotment of agricultural land and urban refugee property. Presently, it is in mega millions. It is most ironic that it was initiated by the Ayub martial law. 17. You earned an SJ in 1965 for singlehandedly capturing an Indian company or company plus while you were a helicopter pilot in the war. Please describe that incident? After the conclusion of the operations in Rann of Kutch (successful), I was assigned the task of assisting in preparation for Operation Gibraltar. Various training camps had been established in May 1965, and co-ordination and assessment of standards of training attained was essential. Brig Ishaq, Commander Rawalpindi Sector was incharge. Resultantly I had to visit 12 Division area frequently. On 1 Sept 65, also, I had been asked to take Brig Ishaq from Murree to Rawalakot. On arrival at Murree, I learnt that Chamb had been attacked and our forces were outside Chamb. On arrival at Rawalakot we heard the same news and kept hearing so while we were there till about mid-day. On completion of his work, I suggested to Brig Ishaq that we should visit Chamb and see what the impediment was. Brig Ishaq readily agreed and we departed for Bhimber the Brigade hqs. On arrival, we heard the same news vis-à-vis Chamb and after a quick lunch, departed for Chamb area. We were totally unprepared as we neither had weapons nor maps. While I was in one of the helicopters with my 21C, Maj Latif Awan, Brig Ishaq was in the other helicopter. In order to ascertain the direction of Chamb, in the absence of maps, we landed in the gun area, in Padhar Nullah. Brig Ishaq decided to go back and did so in the helicopter. After having ascertained the general direction we took off in the second helicopter in the general direction of Chamb. En route, we again landed near a tank and met Major Zafar Majeed, who again indicated the general direction and we took off. It was getting late afternoon. Soon we saw a post and I asked Maj Latif Awan to land near it. Being an avid collector, the intent was to pick up a couple of weapons, from what we perceived was an abandoned post. Maj Awan told me that it was getting late and we indulged in the weapon picking on return. While we were flying, we learnt on Arc-44, that Brigade Commander Brig (later Lt Gen) Abdul Hamid Khan had been ambushed. I began to get in touch with them and asked them to direct the helicopter, if they could see it so that we could pick up the Brigade Commander. In the meantime, I was told by Maj Latif Awan, that we should return as it was getting late (winter afternoon/evening). It was then that I saw the post again and asked him to land. Since I was busy in conversation with the ground, I did not see any personnel in the post. However, Maj Awan informed me that there were some men. Presuming, that they must be dead/wounded, I asked him to land and on touching down, I got out of the helicopter and shouting towards the post, asked the occupants to stand up. It was then that we realised that there were a large number of people. In the post still keen on souvenir hunting, I returned to the helicopter and told Maj Awan that I will go into the post and he should land on the main bunker and after collecting the weapons, we shall take off. He cautioned me that there may be a minefield around the post. I then asked a Sikh to come out and asked him to lead me into the post, when he confirmed that there was a minefield. once inside the post, I was informed that they had received some shelling in the morning, two ors had been wounded (since dead) and that their company commander, Major Negi had left them in the morning on pretext of getting supplies. At this moment, I saw two Indian fighter aircraft headed towards the post (possibly having sighted the helicopter) they were coming in to attack. They made a pass over so as to align themselves for an attack. I immediately indicated to Major Awan about air threat and that he should take off. He did so. Just then the iaf aircraft came in for an attack and I asked the Indian troops to go to ground. Simultaneously, some paf Sabres came on to their level and shot down both the aircraft. The debris falling near the post. I then realised that it was a company post of 5 Sikh Light Infantry, with heavy weapons like 106 RR, a mortar and mmG from a support battalion (pattern in Indian army). I then asked them to place their weapons G-3s (1965 issue) on the parapet and move out and kept pushing them. Once they were out I asked the JCO to “fall them in”, he did so. I then asked two ors to carry a G-3 each. I then addressed them and we began to march in the general direction of our FDLs. By now it was near nightfall en route, I met Maj (later Maj Gen) Abdullah Saeed and asked him to relieve me of the burden. He refused moving on I met Maj (later Lt Gen) F.A Chishti) 2IC of an artillery unit, I asked him for a vehicle. He refused as they were re-deploying. We moved on and at nightfall reached Moel Post, asked them for some tea for the pws and informed Kharian (where Maj Latif Awan had proceeded) that I was safe. After tea and in the dark (blessed was the full moon) we moved towards Padhar. On arrival at Padhar (Corps Artillery Mess) at 2000 hrs, I asked the pws to sit in the volleyball ground and informed that I was proceeding for dinner and that they would get their meal at Bhimber. When I entered the mess and informed (Brig Amjad Chaudhry Comd Corps Artillery) and his staff, they would not believe me and came out to see for themselves. after a quick dinner, I requested for transport as by now I was fairly tired having 7-8 miles or more. I was once again refused and informed that the vehicles will be free once the bridging equipment had been delivered at Tawi (faulty intelligence that bridging was required at Tawi). At about 0230 a.m, I was provided the transport and asked the PWs to demonstrate their battalion embussing drill. They did so in exemplary fashion and we left for Bhimber. At around 0500, we arrived at Bhimber and the panic started about escorts! However, I handed them over to the Brigade hqs, after assuring them that I would look after their interest. I was picked up at 1000 hrs, along with the souvenaires (Two G-3 rifles) and returned to Dhamial to receive a dressing down from Col (later Lt Gen) A.B Awan for having involved myself in the venture. When the PWs were interrogated, they narrated the incident. ISI late Gen Riaz Hussain (the then DG ISI) informed the President fm Ayub Khan) at a briefing in the evening (2nd Sept 65) and sought his permission to publish the item in the newspapers as it would raise morale of troops. Resultantly, it was published in all newspapers on 4 Sept 65. Since I was not contacted/asked, I was assigned to carry Gen Musa from Kharian to Chamb so as to brief Gen Yahya. He was accompanied by Gen Bakhtiar Rana, Comd 1 Corps. On seeing me Gen Musa asked me if I had seen the day’s newspapers I said “no” and he asked me to get the newspapers from his U8F aircraft. The newspapers carried the story. At this Gen Bakhtiar Rana gave me a dressing down that the army has spent so much money on my training and I was involving myself in such frivolous activity. I was awarded the Sitara-e-Juraat for bravery. I presented one of the G-3 rifles and the 106 MM RR to the Aviation Mess and am the proud possessor of the second weapon. Souvenair hunting had its rewards! I have given such detail because the Citation was written without consulting me and thus does not reflect the true position. I may add that on 8 Sept 65, I met Brig Shami at Khem Karan at 1000 hrs. He asked me details of the event. The same evening he endeavoured a repeat and was martyred. The subtle difference was that Maj Awan was my 2IC and acted at my biddance, whereas, he was accompanied by Brig Bashir, who not only abandoned him but discarded his badges of rank en route. Needless to add that they were confronted by only three people. 18. What do you have to say about the 1965 war as you saw it? I saw 1965 war very closely as a helicopter pilot and had the opportunity to visit all sectors. There were many forgotten heroes of the 1965 war. Air Vice Marshal Eric Hall was instrumental in forestalling an Indian heavy artillery bombardment on Lahore. Colonel (later Brig) Amir Jan Colonel Staff 10 Division came to know that the Indians had brought heavy guns very close to the BRB Canal in order to pound Lahore city. I was the Duty Officer at Dhamial and the PAF C-130, being used as bombers were operating from Dhamial that night. They had been given a target, but when they heard my conversation with the Colonel Staff, they volunteered to take on this target in view of its impact on Lahore (morale). The Army Commanders were very apprehensive about this idea. They feared that some heavy bombs might fall on the brb Canal and damage it. Hall, a thorough professional that he was, convinced me and indirectly the Colonel Staff, who having been there accepted my assurance that the C-130 dropped bombs would not fall on the BRB. The plan was approved. Hall successfully bombed the Indian heavy artillery poised to pound Lahore with C-130’s and the entire regiment was destroyed before even a round had been fired. Another great hero of the war was the Nawab of Kalabagh who ignored the advice of staying away from Lahore. Kalabagh was a great inspiration for the people of Lahore. According to the “Grey Book” he was to move to Thar. However, he refused to do so and said that his body could be recovered from the debris of the Governor House. Then I saw Major General Naseer of 1st Armoured Division and General Hameed of the 11 Division at Khem Karan. Both the General Officers were supposed to co-operate but were not even on speaking terms with each other! And the battle was being conducted by Major (Late Lt Col) Feroze Alam, then GSO – 2 (I). 19. What do you have to say about the highly controversial Operation Grand Slam? I would again say that the plan was brilliant in conception. In this case there were no execution faults too since both Akhtar Hussain Malik and Yahya executed it brilliantly. The fault in this case lay with the higher command i.e Ayub and Musa. They thought that the Indians would come to the bargaining table as soon as we reached the Tawi and occupied Chamb as had happened in Rann of Kutch. Thus they slowed down the advance on the line of Tawi by ordering change of horses in the midstream. (Change of command) in this did not happen. Again they ordered Yahya to slow down after Jaurian was reached. This did not happen. Instead, the Indians had by the evening of 1st September, decided to attack across the international borders —indication being that they injected the Air Force in Chamb area. The design was to offset the losses in Chamb with gains in other areas. While they were clear in their objectives, the calibre of our leadership is evident from the statement of C-in-C General Musa that while sitting in the Ops Room (GHQ) he heard a transmission from Radio Jammu that an attack on Pakistan was imminent (what a source – speaks volumes for our intelligence agencies). He directed the dmo to caution the formations. The DMO asked the GSO-3, Captain (later Lt Col) Javed Younus to send a signal to all formations. It would be recalled that in late August all formations had withdrawn to cantonments. On 6th September when the Indian offensive was launched, there were only the Rangers to confront them. Brig (later Major General) Khudadad Khan, Director Rangers, received the message from his forward troops and then, in his sleeping suit, went around contacting the formation Commanders. It being a Sunday, they were all enjoying late breakfast. However, the PAF took a heavy toll of the Indians. This attack coupled with suspicions by the Indian command that they were deliberately being lured in (new concept of defence), they slowed down their advance and thus enabled the unit/formations to reach their positions. Again, they ordered Yahya to slow down after Jaurian was reached. Events by now overtook them with Indians attacking across the international border — resultantly some forces and the Corps Artillery being withdrawn. The opportunity of reaching Akhnur by the 1st/second evening had been frittered away. The logic that Gen Musa advanced was that if one pushed even a dog into a corner, the dog would turn around and bite! Strange have been the ways of our higher command. 20. What was Brig. (later Lt. Gen) A.A.K Niazi doing in 1965? In 1965, aak Niazi had no appointment and was moving around in Muzaffarabad, when he was appointed Commander 2 ak Sector. From here he was posted to 14 (PARA) Brigade at Zafarwal (to replace the existing Commander – on the plea that the said officer was from signals!). As a consequence of this, he was promoted Major General and assigned Command of 8 Division at Sialkot. His antics at Sialkot are only too well-known to deserve repetition. Additionally, he wasted millions on “Strong Point” defence — the result of a static mind. He was later promoted to Lt Gen rank and sent to East Pakistan, which proved disastrous because he lacked both moral and professional competence. He repeated his erstwhile “strong point” defence. The Mukti Bahini and the Indians came around their positions and despite all bravado, he surrendered to the Indians, which no other Commander would have deemed appropriate. I must also add that on 5th December Gen Niazi donned his pyjamas and entered his bunker and was not to surface until surrender. Additionally, he and his Chief of Staff (Brig Baqir Siddiqi) spent four hours discussing the meal that was to be served to Gen Jacobs, when he came on a visit with the surrender document. He also failed to order implementation of “Denial Plan”, designed to render military equipment unserviceable so that it cannot be used by the enemy. On the contrary, the direction were to clean and polish up all equipment. His moral fibre can be assessed from the fact that he not only received Gen Arora at the Air Field but endeavoured to share dirty Punjabi jokes with him. Gen Arora to further humiliate him brought along his wife with him for the surrender ceremony at the Paltan Maidan. On return to Pakistan, he had the audacity to ask the then coas, Gen Tikka Khan, to order the establishment of his Corps HQs so as to enable him to compile his report. On being denied this he yet had the courage to ask that his “formation flag” be placed on his staff car. He was ticked off and suitably reminded that he had not returned as a victor but a vanquished Commander so as to put him in his place. 21. Did the standard of training of the Army improve after 1965 or not? I would say that very few lessons were learnt. The Army was run on personal likes and dislikes. Thus Brigadier Irshad who was one of the principal characters responsible for the intelligence failure as Director Military Intelligence was promoted whereas in terms of justice he should have been retired. Characters like A.A.K Niazi who had nothing to do with any fighting were awarded Hilal-i-Jurrat for some action which never took place at Zafarwal simply because he was from Ayub Khan’s unit. Thus Niazi was promoted to General rank and we finally saw him in East Pakistan. That is history. In 1962 while writing A.A.K Niazi’s ACR for the year 1960-61 Major General Atiq ur Rahman had written that “This officer had reached his ceiling and should not be promoted to Brigadier rank”. Unfortunately, it was an Army run on personal likes and dislikes. Niazi was from Ayub Khan’s unit! Ayub Khan ignored Atiq ur Rahman’s report and promoted Niazi to Brigadier rank. 22. Please describe this intelligence failure on part of the the Pakistani Director Military Intelligence (DMI)in greater detail ? The SSG (commandos) captured a despatch rider of the Indian Army on the Jammu Samba Road on night 3/4 September 65 carrying the mail of the Indian 1st Armoured Division. This mail bag was taken by Director Aviation Brigadier Mahmud to the DMI Brigadier Irshad who dismissed it as an Indian deception plan! Thus the DMI insisted that the Indian 1st Armoured Division was at Jandiala Guru, East of Amritsar while in reality it was in Samba area right next to our jugular vein in Sialkot sector! Thus once the Indian 1st Armoured Division attacked us opposite Chawinda on 8th September we were caught off balance. And then kept reacting to situations. The initiative had been lost, thanks to intelligence. The move of the formation takes 7-10 days, which acts as warning time. A.H Amin’s Note:–Despite this imperial faux pas this officer the DMI Brigadier Irshaad was promoted major general and later as corps commander 1 Corps in 1971 where he was again highly incompetent ! 23. Please tell us something about your service profile from 1965 till 1971? Till 1968 I stayed with the Army Aviation flying the oh-13 (Bubble) helicopter. In 1967 I went to ussr to conduct trials of MI-8 helicopters. In 1968 I reverted to artillery so as to command my parent Regiment 4 Field and took the Regiment to East Pakistan (Comilla). I reverted to aviation in Feb 69. Later in the year I took MI-8 and Alouette-3 helicopters to East Pakistan and remained with them to familiarise them with East Pakistan. (As a young Alouette-3 pilot your Publisher and Managing Editor was part of the contingent). In December 1970, I once again proceeded to East Pakistan to organise appropriate utilisation of the helicopters in the cyclone relief. In the December 1970 elections and the early part of the counter insurgency operations the pilots rendered yeoman service. Appreciating the impending political change, I drew up the plan for evacuation of all helicopters to Burma in the event of necessity. The plan was enforced and no helicopter was surrendered. In fact, they evacuated the ladies and nursing staff — apart ofcourse, from the very brave Gen Rahim who abandoned his command. I was given the immediate award of Tamgha-e-Pakistan (since the area had now been declared an enemy occupied area). In March 1971, I reverted to Dhamial as GSO-1 Base. In 1966, on my recommendation, the Alouette-3, helicopter was introduced into service and a conversion school set up in the squadron. In August 1971 I was promoted to the rank of Brigadier and posted as Commander Artillery 23 Division Jhelum. The division’s operational area was Chamb-Dewa Sector and it was deployed in the field in Kashmir and northern fringes of Pakistani Punjab. It was here that I had the opportunity of serving with the Late Major General Eftikhar Khan who I had already met in Rann of Katch in 1965 and in Chamb-Jaurian sector during Op Grand Slam. 24. How did the Army Officers view the second Martial Law as Pakistanis? The situation at that time was highly complex. It turned out to be worse than what anyone could have expected. It turned out to be the precursor to disintegration. 25. What is your opinion about General Ayub, Musa and Yahya. How would you compare all three as professionals? Ayub was not competent but was promoted simply because of the unfortunate crash of General Iftikhar and Sher Khan. About Musa I would say that everyone is aware of his professional capabilities. Yahya was a thorough professional from Chamb. However, his contact with Rani in this period proved his undoing. I would add that Lieutenant General Habibullah Khan was relatively speaking a thorough professional but was sidelined since he was perceived as a potential political threat by Ayub. He repaid Ayub for this by establishing the Gandhara industry. Along with his, Ayub’s son, Gohar Ayub and tarnishing his image totally. It can be said that by appointing Musa as C-in-C, he lost the 65 war and by his appointment as Governor West Pakistan he lost his government. 26. You served under Gen Eftikhar in 23 Division in Chamb during the 1971 war. What are your impressions about General Eftikhar as a General and Field Commander? Eftikhar was a thorough professional, an excellent Field Commander and a very brave man who led from the front. It was a great experience fighting the 1971 war with Eftikhar in command. 27. What was your war experience as a Brigadier in 1971? Basically I was Commander Artillery 23 Division. I planned an extremely unconventional deployment of artillery to which General Eftikhar agreed. We deployed the artillery unorthodoxically close to the front line, with field guns at 2000 yards from the fdls and medium guns at 4000 yards, and ahead of our own defensive mine field. This paid great dividends in terms of fire support. The Indians in an effort to neutralise us resorted to counter bombardment many miles in our rear. Theoretically they were right since they thought that artillery would never be deployed so close to the front line. In addition some other innovations were also taken in hand. The Locating Battery had not been issued their equipment (radars and sound ranging) and to be used purposefully they were issued old vintage 105 MM howitzers and made history by fighting as a gun battery! Elements of Mujahids were provided and to use them purposefully they were organised into a mortar battery and issued 120 mm mortars. To befool the Indian two heavy guns of World War I vintage were taken over from the school of artillery suitably deployed and directed to fire on Jaurian — indicating the presence of Corps Artillery. Further more Infantry and Artillery was denuded from the mountainous area. Similarly all targets were engaged at rate rapid so as to demoralise Indian infantry. When initial reports of our attack were received by the Indian formation commanders they chided the unit commanders that they were suffering from illusions, being aware that we did not have the resources. On 5 December I was detailed to command 111 Brigade since its original Commander Brigadier Rahimuddin (later full General) did not join his Brigade despite saying before the war that he would do so once war had commenced. The ms (Military Secretary) Brigadier Nasrullah was not in favour of having an Artillery Officer to command an Infantry Brigade. However, General Eftikhar instructed me to take command of the 111 Brigade which I did till I was injured by enemy shelling on 6 December. It was on this day that I received my second sj coincidentally within 100 yards of where I had received my first SJ in 1965 war. 28. What are your impressions about operational level leadership in the 1971 war? I would only comment about the 1 Corps area which I saw as a direct participant. The Corps Commander had no operational talent and should not have been promoted after all that he had done in 1965 war. He lost his nerve from the first day of the war. This led to a very serious operational failure. Under the basic concept/plan 17 Division was to be under Command 23 Division for all operations north of Ravi. 66 Brigade (ex 17 Division) and 17 Division Artillery joined us before the war. Later on getting cold feet General Irshad informed GHQ that he could not guarantee holding of Sialkot and in response to his request 17 Division less Brigade were made available to him and deployed on Maralla-Ravi link. They did not see battle and were wasted. This militated against a decisive breakthrough in Chamb. I would say that our performance was very poor at operational level in the 1 Corps area in Sialkot Shakargarh area. 1 Corps Commander’s unnecessarily exaggerated reports imposed a defensive mindset on the ghq as a result of which the 6 Armoured Division was not used offensively and the momentum of advance was seriously slowed down. In addition 1 Corps Commander had no understanding of artillery. Corps Artillery HQ was kept at a distance of 10 miles from 1 Corps HQ and Gen Irshad would not even allow the Commander Corps Artillery (Brig Iqbal Malik) to enter the Corps Operations Room. Resultantly there was no co-ordination between the Corps Reserves and Corps Artillery for launching counter attack plans. The situation at Brigade level was no different and resulted in the fiasco at Barapind. 29. It has been said that had General Eftikhar not died (embraced martyrdom) in an aircrash in the war many officers would not have reached general officer rank ? There is no doubt about this. At least five (Brigadiers) Officers would never have been promoted. Similarly other Officers (Brigs) who became full General would have met their Waterloo if the Awan Committee Report had been acted upon or if cases of failure in command had been reported. 30. Please tell us something about your service pattern from 1971 till you left the Army ? In November 1972 I was posted as Inspector General Frontier Corps. I was still a Brigadier at this time. The Frontier Corps at this time included nwfp, Balochistan and Northern Areas under a single headquarter. Once I took over command I noticed that many Frontier areas were un-occupied by the Federal Government. On my recommendations the Federal Government authorised us to occupy Kakar Khurasan area in Balochistan. This area had been abandoned by the British since 1919 there was no government presence (civil or military) till April 1973. We occupied it peacefully. Similarly we occupied the Mohmand Area which had been abandoned since 1935. In addition we deployed in the Mekran area. Mekran Scouts had been disbanded on refusal to participate in Dir-Bajaur Ops in 1960. Thus development was started in the tribal areas which in 1972 had a budget of just 44 lakhs and in the space of five years went upto 30 crores. In November 1974 I was posted to command 14 Para Brigade in Sialkot. In August 1975 I was promoted to the rank of Major General and tasked to re-raise the 14 Infantry Division at Okara. On 1st March 1976, the same day that Zia was promoted as Army Chief I was retired from the army since Mr Bhutto wanted me to serve as Governor NWFP. 31. What was your opinion about Mr Bhutto as you saw him as a Minister the period 1958- 1966? I had seen Mr Bhutto as a Minister in 1958-66 as an Army Major and felt that he had great talents. From 1972 onwards I saw him far more closely as IG FC. 32. What do you have to say about the Balochistan problem of 1974-76? This problem was created through the intrigues of Khan Abdul Qayyum Khan, the then Interior Minister. Qayyum was an arch intriguer and wanted to strengthen his party in Balochistan. Thus the problem in Lasbela was started due to his machinations. Mengal was a patriot who was manoeuvred into a controversial role through Qayyum’s intrigues. I may add that the motivation of taking the army to Balochistan was positive. Given the task even the fc could have done the job as we earlier did in Kakar Khurasan. Mr Bhutto was a bit impatient since all members of his family had not crossed the 50 year age mark. He wanted to do away with the Sardari System and bring development in Balochistan. Regrettably, the Chief Secretary and the Corps Commander were brothers and this led to a much quicker employment of the Army. 33. What about the Hyderabad tribunal and disengagement of the army from Balochistan? It is on record that Mr Bhutto wanted to withdraw the Army from Balochistan in 1976. The then Army Chief Zia opposed this idea. In addition around the same time Mr Bhutto wanted to wind up the Hyderabad Tribunal. This was again opposed by Zia as Army Chief. Ironically Zia did exactly what Mr Bhutto wanted in 1977 rather than 1976. The two subjects were discussed in my presence in November 1976 at Dir. Zia had wanted to use these as excuses pretexts for military take over. He was already in collusion with the opposition. 34. You were selected as Governor NWFP in 1974-75. How did this occur ? Mr Bhutto had already seen me as IG FC and was keen to have me in the province as a Governor since the province was a political trouble spot and he wanted to integrate the tribal areas and organise the nascent Afghan resistance, a task, commenced by me in October ’73 as IG FC resistance. 35. So how was this stint? We did well. During this period there were a large number of bomb blasts in the NWFP with Ajmal Khattak and Azam Hoti sitting in Kabul indulging in anti-Pakistan speeches and activity. In order to convey a message to Sardar Daud that we could play the same game and to assess the training level of the resistance an operation was initiated in Panjsher Valley in August 1975. The operation was a total success. The Afghans suffered heavily in men and equipment and Daud sought peace and accepted the Durand Line. He initiated an agreement in mid-1976. However, the formal agreement was not signed in view of Zia’s take over. 36. When did Pakistan enter the Afghan scenario as a party, which was assisting the anti-Daud insurgents in Afghanistan? In October 1973 while I was serving as IG FC an Afghan named Habibur Rahman (Shaheed) came and contacted me about setting up a resistance movement in Afghanistan with active military assistance of Pakistan. I conveyed the same to Mr Bhutto, who accepted my proposal in view of the changed situation in Afghanistan and asked me to organise training of Afghans. 37. What was the political and military aim of the Pakistani govt of that time? From 1947 till that date all Afghan governments had generally not been friendly towards Pakistan. They raised the bogey of Pakhtunistan but refrained from acting against us in 1965 and 1971 when at war with India because of the political environment after the Liaquat Bagh meeting. There were a large number of bomb blasts. Mr Z.A Bhutto was very clear even in 1973 after Daud’s coup. An analysis of the regional environment was undertaken, highlighting the break in the Afghan system of continuity; the impending generational change in the leadership in the USSR and China (Chou had died). The inability of continuity/stability in Iran with removal of Shah of Iran from the scene. Being the last of the party ideologues it looked likely that the USSR leadership may take the opportunity to move once more and invade Afghanistan, a step towards the fulfilment of Peter the Great’s will (1777). Thus we established the base of Afghan Mujahideen resistance in 1973. 38. What type of assistance was provided to the Afghan resistance and which Pakistani agencies were involved? We gave them basic infantry weapons, some specialised training in how to conduct guerrilla warfare under an SSG team until it was discontinued 05 July 1977 by Gen Zia, who lacked the strategic vision. 39. At what stage did the SSG enter the scene as the principal agency that trained the Afghan resistance? A.H AMINS NOTE:– THIS ASSERTION OF BABAR IS FACTUALLY INCORRECT. 40. What was theISI role in Afghanistan in the period 1974-77? It was a top secret affair and the ISI had no role. The secret was shared between Mr Bhutto, myself, Aziz Ahmad and the then Army Chief Tikka Khan. This was for obvious reasons. The Foreign Office could with, nonchalance deny if raised at un or any other forum. 41. Who were the pioneers of the anti-Daud Afghan resistance? These were Ustad Rabbani, Hikmatyar, Ahmad Shah Masood and a host of others who came to Pakistan after October 1973. 42. You have been a committed member of the PPP? At what stage did you decide that you must join Mr Bhutto’s party? I was impressed by Mr Bhutto’s progressive policies since 1972. On 27 July 1977 after Martial Law Mr Bhutto personally requested me to join the PPP. I did so out of conviction once Mr Bhutto was out of power. 43. Why did Mr Bhutto select Zia as a COAS? There were a number of reasons and these were discussed with me personally by Mr Bhutto, while in detention at Murree. One was the pretended humility and this disarmed Mr Bhutto into the belief that he would pose no threat to the nascent democracy. Secondly, his performance when he invited Mr Bhutto to the centenary celebrations of 11 cavalry at Kharian. He took pains to ascertain Mr Bhutto’s tailor in Karachi (Hamid Khan) and had a Blue Patrols as Colonel-in-Chief of Armoured Corps. On entering the room, Mr Bhutto found a suitcase on his bed and on inquiry was told that it contained the Blue Patrol. The next day, Mr Bhutto was requested to climb a tank and engage a target. Quite obviously the target was hit. Then was his performance while on deputation in Jordan, where he killed a large number of Palestinians (Black September), Mr Bhutto was led to the belief that if he was so loyal to Jordan, he would be even more loyal to Pakistan. His prime performance came at Multan, where he invited Mr Bhutto as Colonel-in-Chief. After the function, when Mr Bhutto had barely returned to Mr Sadiq Qureshi’s house, when he was informed that General Zia requested to meet him. Mr Bhutto was surprised, having met him in the mess a little earlier. However, he called him into Mr Sadiq Qureshi’s study/library. Gen Zia on entrance went round the Almirah, looking for something and on inquiry he revealed that he was looking for a copy of the Holy Quran. On finding a copy he placed his hand on and addressing Mr Bhutto he said, “You are the saviour of Pakistan and we owe it to you to be totally loyal to you”. Then was the fact that there was little to pick and choose amongst the other aspirants. The only other suitable candidate was General Majeed Malik who was Mr Bhutto’s favourite as a sound professional. Unfortunately was involved in the International Hotel Scandal where he was caught with Mustafa Khar. He was sent as Ambassador to Libya. Finally, of course was the American angle. They had picked Zia as suitable material at Fort Leavenworth, followed his career progress and possibly lobbied in his favour. They made it known to friends months in advance that he would be appointed COAS. Zia’s obsequeous behaviour made Mr Bhutto think that he was a non-political man. Pakistani democracy was at an infant stage and could not afford an Army Chief with political ambitions. Then there was not much choice. Gen Sharif was considered politically unreliable since he had been very close to Ayub Khan. Jillani had no command experience and was the head of isi. Akbar Khan had not performed well as a GOC 12 Division in Kashmir in 1971 war. Gen Aftab and AB Awan had no command potential and were not suitable. 44. How would Mr z.a Bhutto have behaved had he been in power when the Soviets invaded Afghanistan? Mr Bhutto laid the foundation of the Afghan resistance in 1973. He had the foresight and vision to do it. As a matter of fact we created the organisational network which was used by Zia and the usa to oppose the Soviets. Zia had a short term vision and ignored the political angle of organising an Afghan government in exile with ulterior aims of gobbling us aid. Had Mr Bhutto been in chair he would not have deliberately neglected the political angle like Zia. Even Daud was convinced by Mr Bhutto in 1976 and said “Pakistan and Afghanistan are in the same boat. If it is the threat from the North (USSR) it is Afghanistan today and Pakistan tomorrow. If it is the threat from the South (India) it is Pakistan today and Afghanistan tomorrow”. You see after 1971 Indian strategists had placed Pakistan and Afghanistan in the same category as the next target. Mr Bhutto laid the foundation of the Afghan resistance for reasons discussed earlier. However, being a political animal, he also continued with a political alternative/solution. In November 1976, in consultation with the resistance leadership two individuals, namely Wakil Azam Shinwari and Yunus Khugiani were selected to proceed to Rome and request King Zahir to return and as his father had done earlier, to lead a movement into Afghanistan. The caveat was that Zahir Shah could return as a constitutional monarch under the Constitution drafted by Mr Musa Shafiq, a former Prime Minister and the mentor/founder of the Hizb in Afghanistan. However, Zahir Shah indicated that he was willing to play his role but he would first visit Saadat (Egypt), then visit the Shah of Iran and finally arrive in Pakistan. Mr Bhutto was confident that King Zahir Shah could act as a rallying point and play his historical role. Events, however, took a different turn and martial law was imposed in Pakistan. The other aspect was the negotiations with Sardar Daud. Even Daud as earlier discussed had accepted the Durand Line in 1976 and wanted peace with Pakistan. 45. How would you assess Zia’s Afghan policy? It was based on sheer opportunism and personal interest. Initially, he lacked the vision and, therefore, suspended financing the movement. This resulted in break-up of movement from one to seven groups — each leader fending for himself. Secondly, when the Soviet invasion took place he did not form a government in exile, which could gain experience during the Jehad and be available when the Geneva talks took place. Also all the us/Saudi and other assistance would have been routed through institutional organisations (Ministries) rather than individuals and would have prevented heart burning and divisive tendencies. Finally, he opposed the Geneva talks and visualised only a military solution – the bane of all our subsequent military leadership — Hamid Gul, Beg etc. We were very deliberate. Every resistance is based on a political centre, a hierarchy, like the DeGaulle government in exile, the Algerian and Yugoslav Government in exile etc. Zia deliberately kept the Afghan Mujahideen divided into various groups in order to ensure that the bulk of the us aid could be embezzled. The future events thus led to the post-1988 civil war in Afghanistan. 46. What was the role of the COAS General Mirza Aslam Beg and the President Ghulam Ishaq Khan in the period 1988-90 in destabilising the PPP Government? Initially Ghulam Ishaq was very grateful to the ppp for having elected him as the President. After about three months he changed into his true colours and actively started conspiring with the then coas General Beg & IJI to destabilise the PPP government. 47. What is your opinion about limiting or totally finishing the ISI’s political role? They should have no political role as ISI. It is an Inter Services Intelligence agency. 48. How would you define your Taliban policy? The Taliban was a purely indigenous movement. We came in where we rightly assessed that the Taliban were restoring peace in Afghanistan and our chief interest being that there would be no peace in Pakistan unless there was peace in Afghanistan. Our policy was based on purely humanitarian grounds and the cornerstone being the unity and integrity of Afghanistan. We were not interested in individuals but the well being of the Afghan people. In September they entered Kabul and in October we commenced negotiations between the Taliban and the Northern Alliance. A formal draft was prepared. It was to be finalised on 5 November 1996, because of an important clause (political) was removed by Dr Hulls, the un representative on Afghanistan. On 4 November President Sardar Farooq Leghari dissolved our government. 49. What do you have to say about the so-called accountability drive launched by the present military junta ? Accountability is a farce. This was well proved once Nawaz Sharif was pardoned. Another test case is that of Qidwai a highly corrupt man who is Pakistan’s Ambassador in Kenya and goes around bragging everywhere that it was he who persuaded Mr Nawaz Sharif into appointing Musharraf the Army Chief! Furthermore important segments like Armed Forces Officers, judges and ulema have been excluded, they are no angels! 50. What is your advice to the present military junta? Why should I offer them any advice. They came through their own free will. 51. A CIA report predicts fragmentation of Pakistan. What is your opinion? What are your thoughts about the future of Pakistan ? Pakistan is here to stay. Despite all failings and setbacks on the whole great progress has been made. The human mind is never satisfied. In 1947 Pakistan had hardly any industry. Since 1947 great progress has been made. Initially Pakistan suffered great setbacks like the early death of Mr Jinnah, the aircraft crash in which Gen Iftikhar and Sher Khan died, the assassination of the first Prime Minister and selection of Ayub Khan a non-professional soldier with poor/nominal war record and a pathetic performance in the Punjab Boundary Force. While the first Constituent Assembly had delayed Constitution making and elections Ayub actively conspired with the bureaucrats to destabilise democracy. All these factors greatly retarded progress. But for Pakistan there would have been no Pakistani Presidents, pms, Ministers, Governors or Generals etc. It has been a blessing. Look at the abject poverty and third rate citizenship of Muslims in India. If there was no opportunity the ilk of Beg, Jamal, Moin or Musharraf would not have come to Pakistan. We are generally an ungrateful people. In retrospect we are much better off in 2001 than in 1947. There is great hope I have not lost faith in Pakistan’s future. I dismiss the assertion that Pakistan is a failed State!